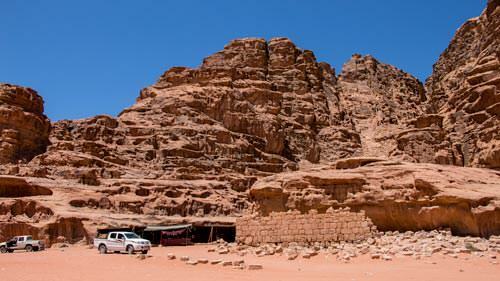 On this page you find more information on the Wadi Rum desert sites. We listed them in alphabetical order. 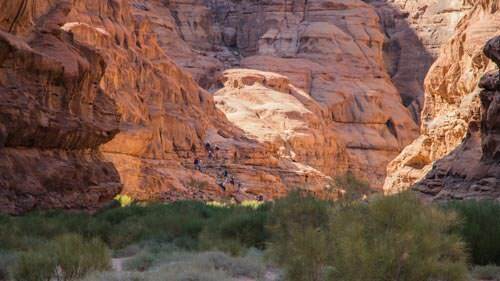 Abu Khashaba canyon is one of the canyons in Wadi Rum area that is worth a visit. This red and yellow sand canyon is surprisingly green with desert bushes and trees. It has the shape of an hourglass with a narrow middle section. To reach this section, you have to scramble up some rocks. The mountainsides look like artwork. Over time the beautiful shapes were formed by wind and rain. In some, you can recognise shapes of animals and faces. A pleasant walk through the canyon takes about 45 minutes. On the side of Jabal Anfishiyyeh is a big rock wall. 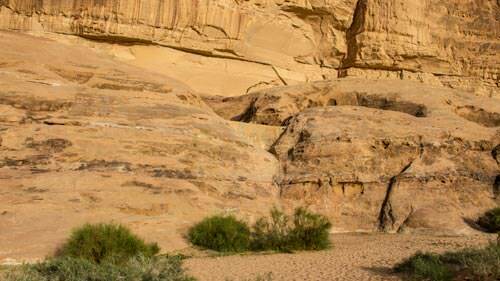 Some of the best Thamudic and Nabatean petroglyphs and inscriptions in Wadi Rum are found here. Among the petroglyphs is a herd of camels. Some camels suckle their calves. Hunters ride some camels. There are also some strange circle-and-line symbols and inscriptions. Most of the petroglyphs are believed to be drawn by people travelling in the big camel caravans in previous times. 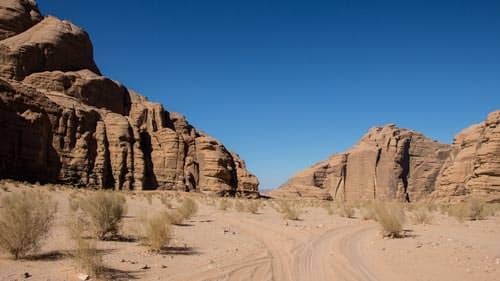 They passed Wadi Rum on their way from Damascus to Hejaz. Barrah canyon is a 5-kilometre long corridor of rock that splits the Barrah massif into two parts. This yellow sand canyon is considered to be one of the most beautiful canyons in Wadi Rum. Flat sandy sections, greener plant-rich areas, and sand dunes are flanked by impressive vast multi-coloured cliffs and towers. 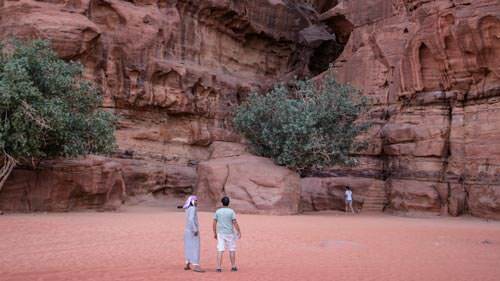 This canyon offers excellent opportunities for hiking, climbing and camel trekking. Hiking the canyon takes about 1,5 to 2 hours. Natural water resources in Wadi Rum desert are limited to a few springs. Bedouin tending animal herds need water to be available in more places. Therefore they constructed dams in hollow parts in the lower sections of mountains around the desert. In these hollows, they collect the water which is running from the mountains during rainfall. During winter and spring, most reservoirs pretty much fill up. Parts are protected from the heat slowing down the inevitable evaporation. If needed, footholds were built to make reaching the pools easier. At the north ridge of Jabal Burdah stands the 35-meter high Burdah rock bridge. This bridge is considered one of the highest natural arches in the world. 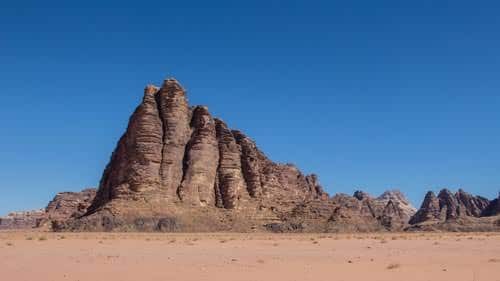 It is one of the most spectacular sites in Wadi Rum. You can see the bridge from across the valley. When you are reasonably fit and do not have vertigo you can climb the rock bridge from the north side in about 3 hours. The views on Wadi Rum from the rock bridge are mesmerising. 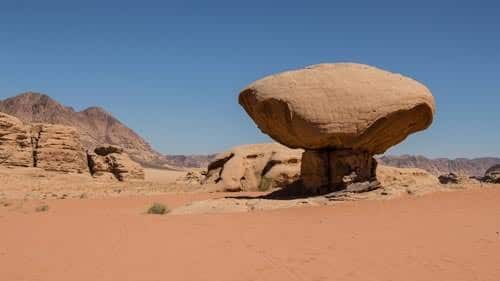 Wadi Rum desert has a couple of famous, solitary, unusual rock formations. Cow rock, also know as chicken rock, is one of them. This photogenic rock, like all other rock formation, over time, was shaped naturally by erosion. This mountain is close to the border with Saudi Arabia in the Al Forah area. This area, also referred to as the ‘wilderness zone’ is far less visited as the famous heartland. Jabal Al-Hash is easy to climb and probably the most beautiful and fun one. In some places, you can discover fossils. And the sun makes the salt crystals sparkle in the sand. They are the silent reminders of the water richness past of this area. 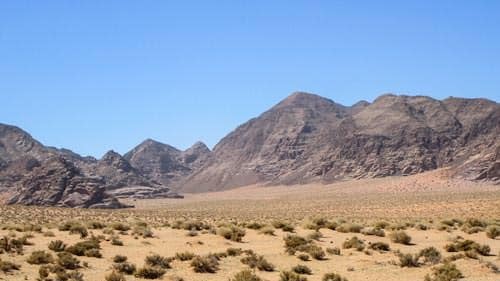 The views of both the north and the south of Wadi Sabbat are excellent. This area is one of the places where you can see the red sandstone change into the white sandstone. 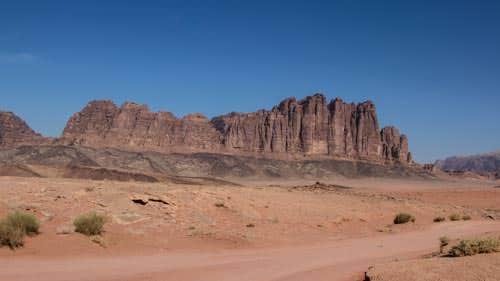 Jabal Al-Qattar is one of the iconic and most impressive mountains in Wadi Rum desert. It kind of looks like a castle with many high towers. Most visitors only see it from a distance when enjoying the sunset in Um Sabatah. Jabal Al-Qattar, like Jabal Rum, has a granite base with limestone in the top. The stone type can absorb water. The water slowly descents until it reaches the granite. As granite cannot hold water, it is pressed out forming little natural springs. These spring are quite easy to find as you will see some plants and trees growing there. With 1854 meter above sea level Jabal Um Ad Dami is the highest mountain in Jordan. 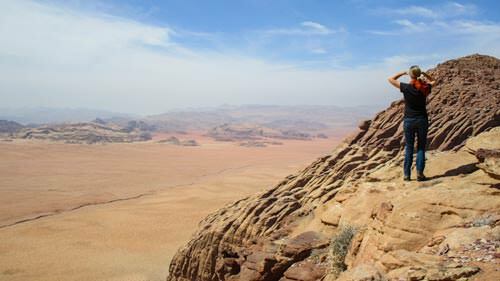 If the sky is clear, the views of Wadi Rum, Saudi Arabia and the Gulf of Aqaba are striking. The top of this mountain is home to the hyrax; a small rodent-like mammal that lives under the rocks. If you are fortunate, you might spot them while hiking. Hiking Jabal Um ad Dami is quite straightforward and straight up over the rocky mountainside. 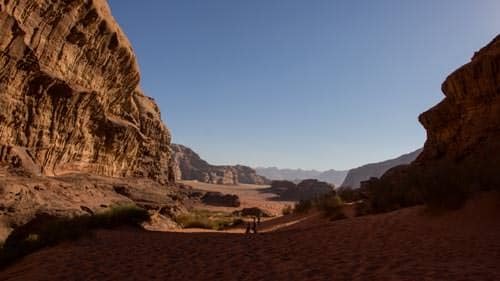 The most visited canyon in Wadi Rum desert is Khazali canyon. From this small canyon, you visit no more than the first 100 meters. 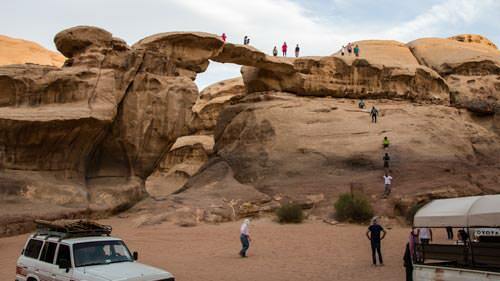 The Nabatean and Thamudic petroglyphs and inscriptions on the inside walls are the reason why so many people visit this place. The petroglyphs and inscriptions cover the walls at different heights. 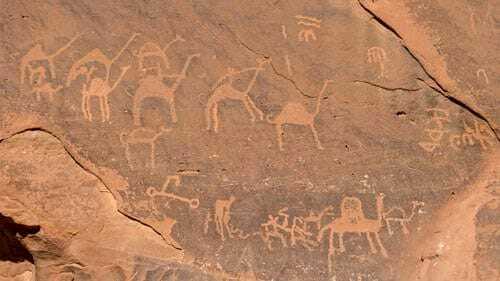 Among them are stylize drawings of people, camels, horses, mountain goats, pairs of feet and writings from dating back to the pre-Islamic and Thamudic time. 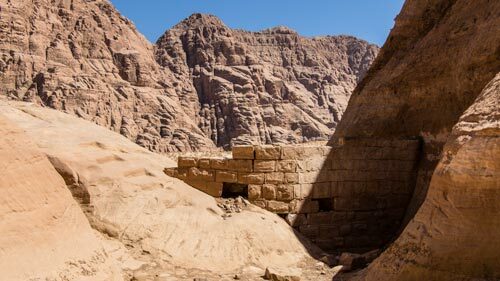 Additionally the Nabateans built water holes to collect the water from the rainfall during winter and spring. The current structure of the Lawrence house was built by the Romans upon the remains of a Nabatean building. Nobody has the defining evidence that this, in fact, was the house of Lawrence. There are stories about him staying here for the night before travelling onwards to Aqaba. And other stories mention that he used this place to store weaponry. The house itself is pretty much a ruin, and not very impressive. But the location is another beautiful spot in the desert not to be missed. This natural spring is located only three kilometre south-west of Rum village. The spring gives fresh water to the local Bedouin families. It’s named after the British army officer T.E. Lawrence. He crossed Wadi Rum desert during the Arab Revolt in the early 19th century. A scramble over the rock brings you to the fig tree. Next to the tree, you will find the spring. The views of the desert are spectacular. At the foot of the mountain, you see multiple inscriptions of Thamudic origine. Little bridge in Khor al Ajram is named after its sizes. 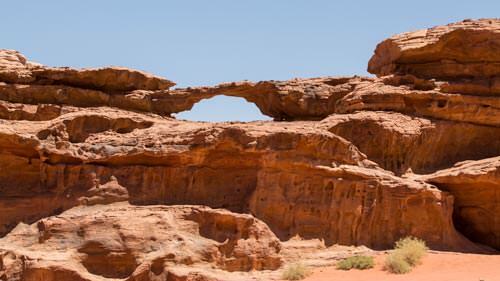 With its approximately 4 meter span, it is one of the smaller rock bridges in Wadi Rum desert. You can easily touch the bridge when standing on its base. Reaching the top of this rock bridge takes only a few minutes. And the reward is fantastic, superb views over the red sand valley. And in the backdrop, you see famous mountains like Jabal Khazali, Jabal Rum and Jabal Um Ishrin. 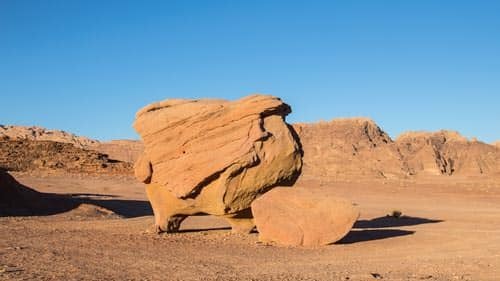 Wadi Rum desert has a couple of famous, solitary, unusual rock formations. Mushroom rock is one of them. This photogenic rock, like all other rock formation, over time, was shaped naturally by erosion. Rakhabat canyon links Jabal Um Ishrin to Jabal Ansranieh. The entrance is a few kilometers east of Rum village. You can scramble through this canyon that offers an abundance of shade from the desert heat. It’s an excellent place to learn about the ecosystem inside a desert canyon. 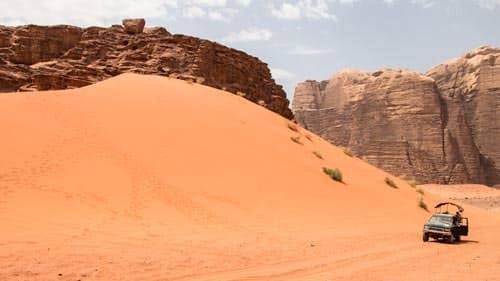 Wadi Rum desert is dotted with sand dunes. Both yellow and red. Most of our tours include a visit to either the red sand dune near Khazali or the dune near Wadi Um Ishrin. The sand dune near to Khazali is easy to climb. And has a beautiful valley view. More challenging is the dune near Wadi Um Ishrin. But you will be rewarded with impressive views. Um Sabatah has a great sand dune for watching the sunset. The natural water resources in Wadi Rum desert are limited to a few natural springs only. When the Romans ruled in this area, they built some reservoirs. The dams are constructed from the typical big Roman stones, using the hollow parts in the lower parts of mountains as a basin. Water running from the mountainsides during rainfall collects in the pool. Partly protected from the sun and heat; the inevitable evaporation is slowed down. If needed footholds were built, to make reaching the reservoirs easier. Nowadays these dams are still used and maintained by the Bedouin. 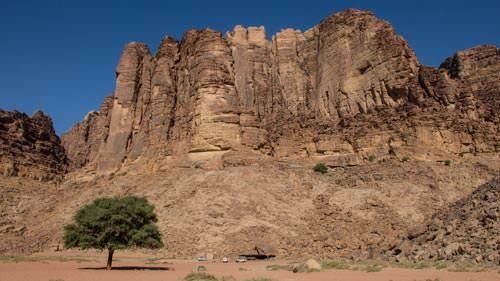 The Seven Pillars of Wisdom is a stunningly shaped mountain opposite of the Wadi Rum visitor centre. If you look carefully, you will see that there are only six pillars. In fact, the mountain is named after the famous book of T.E. Lawrence back in the 1980’s. Before, it was known as Jabal Al-Mazmar. We still refer to it by its original name. Some believe Lawrence named his book after the mountain, but this is not true. He took the title from a verse in the Bible. In Proverbs, it says, ‘Wisdom hath builded her house, she hath hewn out her seven pillars’. Um Sabatah is located in the red sand desert about 10 kilometres from Rum village. It is one of the best places to watch the sunset. From a mountainside, a sand dune or just from the valley floor. You can enjoy the changing colours of the sky, sand and mountains as the sun starts to set. It is an excellent place to remake beautiful photos. 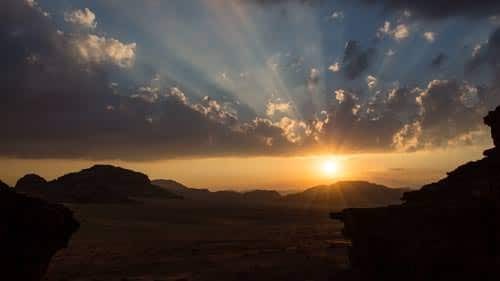 Or sit down and enjoy the silence and the magic of sunset in Wadi Rum desert. Um Fruth rock bridge is about 15 meters up from the desert floor. From the rock bridge, you have spectacular views over the surrounding area. 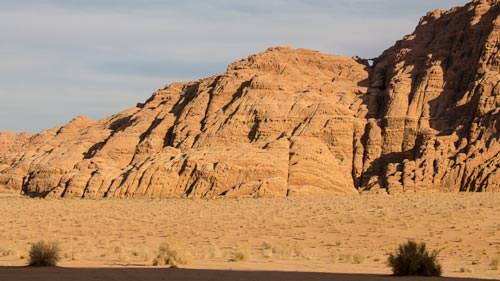 It is one of the most photographed places in Wadi Rum. Climb the bridge following the directions of your guide. Although steep, the climb is not that difficult. You will be on top of the bridge within 5 minutes. Only for those who suffer from vertigo, it can be a real challenge.